Mums are a fall blooming flower that come in white, yellow, orange, pink and burgundy. Their pin cushion-like blooms appear on tightly mounded plants. 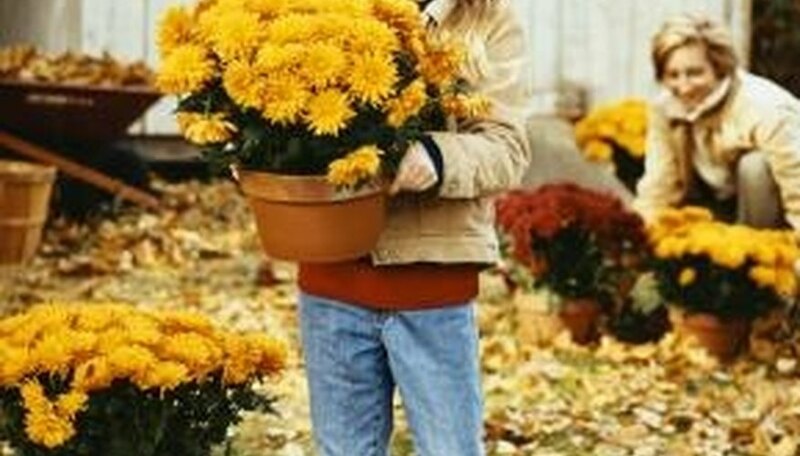 Mums are often sold in pots and can be grown in containers for long periods of time. Mums can be given as gifts of sympathy, congratulations or friendship. Before giving a potted mum as a gift, wrap its pot in colored poly foil to add a decorative touch. Coordinate the color of the foil with the bloom color and occasion. Water your mum plant thoroughly with a watering can. Set the pot in a kitchen sink or on an outdoor sidewalk for 30 minutes to allow the excess water to drain. Dry the outside of the pot off with a soft cloth. Remove any dead or yellowing leaves from the plant stems. Clip off any dead or drooping blooms with a pair of floral shears or sharp scissors. Unroll a portion of colored poly foil on a flat surface with the right side facing down. Poly foil can be purchased at a floral shop or garden center. Cut a piece of foil that is long enough to extend two-thirds up the side of the plant. Fold each edge of the foil inward 1/2 inch. Place the potted mum on top of the foil in its center. The right side of the foil should still be facing downward. Turn the pot so the best side of the plant is facing you. Lift the center of the foil edge in front of the pot with your left hand and lift the right hand foil corner with your right hand so it is vertical against the side of the pot. Tuck the excess foil in a fold behind the corner of the foil. Pull the left hand corner upwards and tuck the excess foil behind it in a fold. Turn the pot clockwise, one-quarter of a turn. Repeat the folding process with the new corner. Continue to turn the pot one-quarter of a turn at a time pulling the foil corners up and tucking the excess behind them until the foil is completely wrapped around the pot. Place a rubber band around the foil in the center of the pot to hold it in place. Cut an 18- to 24-inch piece of ribbon. Wrap it around the center of the pot over the rubber band and tie the ends together in a bow. Trim the tails to the desired length. Remove the foil wrapping before watering your mums to avoid causing root rot or mold.